Consumers are swamped with video content options. New services continue to emerge in a fragmented marketplace of distribution platforms. It’s overwhelming for consumers and, as a result, much video content is left undiscovered and unwatched. Today’s video publishers need to do more than create (or acquire) must-see content. The need to attract and engage consumers and provide a return on investment to marketers. PwC’s Consumer Intelligence Series, Can you find that show I didn’t know I wanted to watch? How tech will transform content discovery focuses on the key questions of digital content discovery, its influencers and improvements needed in personalized recommendations. Consumers have an appetite for new content. Half of consumers (55%) report they are looking for a new TV show or movie to watch at least once per week; 83%, a few times per month. 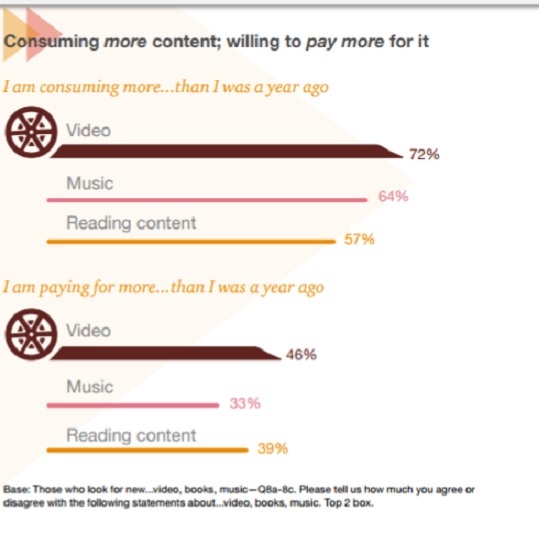 Close to three-quarters (72%) of consumers are watching more video content than a year ago and just less than half (46%) are paying for more content. Yet, consumers are frustrated with the content discovery process. Nearly two-thirds (62%) of consumers agree that they often struggle to find something to watch, despite there being many choices available to them. Further, the findings show that half of consumers (50%) are frustrated when they search for content to watch compared to finding content to read (37%) or music to listen (32%). Interestingly, pay-per-view customers (38%) enjoy searching for new video content to watch more than cord-cutters (31%) and cord-nevers (23%). Even cord-cutters are bothered by the process of finding content to watch. In fact, 74% agree that despite there being a lot of choices available to me, I often struggle to find something to watch and 61% also agree that searching for something to watch is frustrating. There are several key influencers informing consumers viewing decisions. Streaming content plays an important role in content discovery. Eight in ten of all consumers (79%) and 90% of consumers under the age of 30 years old agree that streaming services play a large role in their discovery of new video content. Social media also helps consumers find what to watch (50%), especially for those under the age of 30. Interestingly while there are frequent discussions on social media about video content to watch, consumers don’t necessary based their viewing choices on these discussions. Further, less than half (48%) of respondents said they are influenced by what their friends and family watch. Meanwhile, FOMO (fear of missing out) reportedly also drives 25% of consumer viewing habits. Pay-TV subscribers and non-pay TV streamers differ in the top influences on new content discovery. 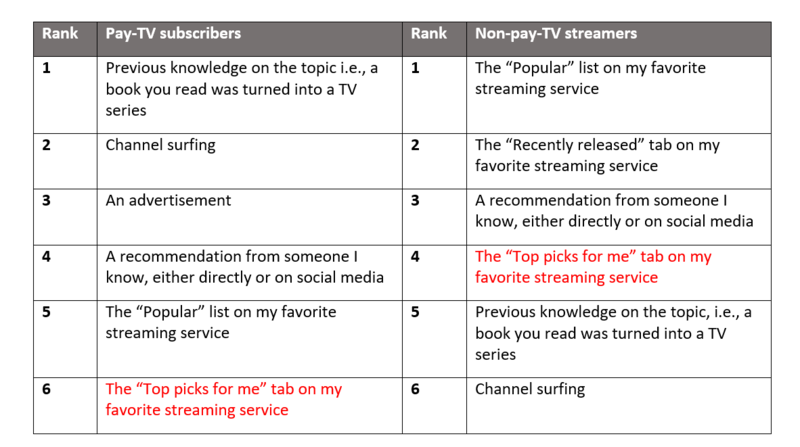 Personalized recommendations appear to be missing its mark ranking number six for pay-tv subscribers and ranking number four non-pay TV steamers. Browsing is still a popular way for consumers to find video content to watch. Almost half of consumers (47%) report that they came across a new show they recently watched while browsing for something to watch. The other top responses included commercials/advertisements looked good (44%), read a great review (32%), recommended to me based on another show I previously watched (27%) and people I know wouldn’t stop talking about it (23%). Consumers are also unpredictable. Eighty percent state that what they choose to watch is largely driven by their mood on that given day. Artificial Intelligence (AI) can help consumers find more content to fit their taste. AI can assist in content curation organizing content by themes. It can also use consumer insights to classify and target consumer segments to test recommendations. AI can look beyond genre categories and include a director, favorite actor, sub-sub-sub-genre, decade, special effects, costumes, etc. Personalization needs to be even more adaptive and include a temperature reading of mood. Content platforms should ask consumers how they feel. After all, 80% report their video content selection is often based on their daily mood. Expanding the search function beyond individual platforms is also important to consumers. They not only want to know what to watch but where to watch. Helping consumers navigate the video content marketplace will assist the content selection process so that video gets found – and watched. In 2017, the advertising industry — both buyers and sellers — experienced many changes that will shape the space moving forward. Some were related to the constantly advancing technology that has become so important in the category. Others dealt with an increased demand for greater transparency from partners. So, with the New Year now underway, there are several areas that I believe are especially critical for the industry to pay attention to in the coming months. Here’s a closer look at four of them. 1. Sharp increase in vertical video. While Snapchat’s stock price is declining, at MediaRadar, we observe that the number of brands buying on their platform is rising sharply. One of the unexpected byproducts of Snapchat’s impact on the market is that those advertisers are now more actively running vertical video – everywhere. Simultaneously, we see more internet use of mobile phones than ever. As a result, we predict a continued, steady increase of vertical video as the vertical format becomes more common. 2. Brand safety becomes much more important. In the beginning of 2017, it seemed like brand safety was a minor issue. However, ater repeated lapses at YouTube (and elsewhere), advertiser confidence is shaken. The scale of the problem is significant. YouTube CEO Susan Wojcicki is taking no chances. She announced she had hired 10,000 people to manually watch videos. And the WSJ’s overview on the people doing the clean-up paints a bleak portrait of what they’re up against. We predict brand safety becomes an important part of 2018 campaigns. We believe there will be fewer ad tech companies at the end of 2018. Here are the headwinds the industry faces. First, MediaRadar observes more MSAs between agencies and ad tech players than ever before. Ad spend is being increasingly consolidated and concentrated. Second, high-profile brand safety failures from 2017 are decreasing the amount of buying on programmatic. Third, follow-on investments by venture capital has declined sharply into ad tech firms. And, finally, companies that sell direct are becoming more sophisticated selling against programmatic, as well as co-opting programmatic for their own benefit. Industry pundits are quick to fret about the negative impact of disintermediation on traditional media businesses. But disintermediation doesn’t actually favor the new vs. the old. Des Moines-based Meredith Corporation is a wonderful example of this. In the past 10 years, they have been careful buyers, scooping up assets from Gruner + Jahr, Disney, Martha Stewart, Selectable Media, AllRecipes.com, and now Time Inc. They’ve also had big success launching new brands, such as their mega-hit, Magnolia Journal, in 2017. The result is a company that will have approaching $5B in annual revenue. The stock has gone up 6X in the past 10 years. Meredith is clearly a recognized leader in the new media hegemony. As we look ahead, expect vertical video, brand safety and consolidation – as well as the growth of Meredith Corporation – to be top-of-mind among advertisers in 2018. Closely following any developments in these areas will be crucial to their success next year, and beyond. When your employer is first and foremost in the television business, and your job is to manage the company’s entire digital presence, you’ve got your work cut out for you. That’s precisely what Jay Yarow, CNBC’s SVP and Executive Editor, Digital faces on a daily basis. He is responsible for everything that appears online outside of what is being broadcast. That means CNBC.com, Facebook, Instagram, LinkedIn – everything. And his approach seems to be working: In September 2017, CNBC Digital reached the number three position in the Business/Finance News category for the first time ever and delivered a record 49.2 million unique visitors in September, which was up 74% year-over year. CNBC Digital also saw impressive growth in mobile with a record high of 30 million mobile unique visitors in September, up 105% year-over-year. And so far this year, traffic from social platforms to CNBC.com has grown 83%. When he came on board in February 2016, Yarow’s goal was to keep a good thing going and expand upon and improve what he could. “They had a great digital brand in place [when I got here]. It was growing before I got here. I helped to accelerate that growth. They have been doing digital for years. I tried to come in and add some extra,” he explained. Sometimes, the seemingly small things make a big difference. For example, when you read a CNBC story and you see the bulleted data points summarizing the story at the top of the page, that’s something that Yarow added. “From my perspective, it’s super valuable. Investors or business leaders tend to be busy and don’t have time to absorb a lot of information,” he said. This way, readers can quickly get the gist of a news story on the way to a meeting when they might not have time to read the whole thing. Above all, his focus is on producing high quality journalism. Then, he asks if “the journalism we are producing being rewarded with an appropriately large audience.” As he points out, it is important to be able to support the production of this journalism so reaching a significant audience and monetizing them is essential. “When you are building something, you have to make sure there is a business there,” he said. To that end, Yarow stays in sync with the business side to ensure that whatever he is doing has their support. “We have really focused on news and making sure we are breaking news. We built out our tech section and made it a strong team. And we are always systematically assessing business news and where we can get stronger,” Yarow explained. Now that the year is coming to an end, let’s look ahead at how the past year’s biggest trends will influence the digital media business in the year ahead. By the end of 2016, increased readership and donations to the likes of the New York Times and ProPublica suggested that partisan politics and the non-stop news cycle, for all its distress, were at least helping the bottom line of news publishers. While some subscription-driven and membership-based publications saw a leveling off of that by the middle of the year, it seems helpful to take a macroscopic view of this trend rather than a quick snapshot: The New York Times recently announced that it has more than 3.5 million subscriptions and more than 130 million monthly readers. That’s more than double the audience it had two years prior. While the Gray Lady’s boost can’t speak for everyone — local news still struggles, for example — it suggests that audiences are becoming more used to the fact that they ought to pay for premium content. With AI also becoming more efficient, and Google and Facebook both making efforts to support subscriptions, expect that technological help, including better personalized targeting and performance measuring, will help boost subscriptions and donations even more. For all the hype surrounding pivoting to video, not everyone who invested in the strategy saw its benefits. Perhaps most jarring was Mashable’s fire sale for $50 million. Given Mashable’s $250 million valuation just last year, the sale price serves as a dire warning to other digital darlings. Mashable is now poised to lay off more employees (last year, investment in video justified a round of high-profile layoffs) as it refocuses its brand yet again. BuzzFeed too, has announced layoffs of about 100 employees after revealing it missed its 2017 revenue targets. Vice Media is also expected to miss its revenue target by more than $800 million this year. CNN Digital announced 2017 brought in its highest revenues ever at $370 million —but it faces a $20 million budget shortfall. And let’s not forget the abrupt closure of DNAInfo and Gothamist. Factoring in that Google and Facebook continue to gobble up digital advertising revenue, many publishers need to diversify revenue streams fast. Digital darlings like BuzzFeed and Vice, not to mention smaller publishers, will have to think beyond native ads. Perhaps the best strategy, as The Atlantic’s Derek Thompson put it, is not to pivot to video or pivot to VC money, but to pivot to readers. Net neutrality, that on-again off-again issue, is officially back on after Ajit Pai, the chairman of the Federal Communications Commission, pushed a proposal to repeal it. Even with the announcement that more than a million of the comments submitted to the FCC were fake, the outcome of the net neutrality vote isn’t in doubt as Republicans control the Commission. The new regulatory environment would be a bust for streaming video publishers like Netflix and Amazon Video, and a boon for publishers under the umbrella of the larger telecom companies that will benefit, including AOL, HuffPost, and NBCUniversal. Meanwhile, the AT&T and Time Warner merger — which the U.S. government is trying to block — would inevitably boost HBO, CNN, and TBS if it goes through. What this amounts to is a huge upending for independent publishers and small businesses used to an even playing field, and the potential bundling of subscriptions and promotions would favor the larger ISPs and telecom companies. Meanwhile, Congress’ clampdown on the technology industry suggests that regulation may also be coming for major tech companies. With opposition on all sides of the regulation debate, expect a topsy-turvy cycle of enforcement — and resistance — in the year ahead. Artificial intelligence is often talked about, but little understood. Expect 2018 to be the year publishers take heavier stock in what it can mean for them. Publishers have already turned toward programmatic advertising, and programmatic video has a huge potential to deliver advertising boosts. However, that doesn’t mean publishers can turn a blind eye on issues like ad tech fraud, high programmatic fees, and lack of vendor transparency. Leveraging AI will mean investing more time in quality control. And while it is the root of many fears, AI doesn’t necessarily mean the complete displacement of humans. Rather, working AI to your advantage can free humans up to do tasks that require much more nuanced attention. Utilizing AI to deliver more meaningful analytics that can help automate repetitive tasks for publishers like social media distribution, for example, or more personalized ad and news targeting, is one way publishers can redirect their energies and consider AI as an aid rather than a threat. If you’ve visited the websites of The New Yorker or The Atlantic lately, you may have noticed options to “listen” to digital stories. Will others follow? Given the attention on the voice — think of the popularity of podcasts and the mainstreaming and price drops of home speakers like Google Home and Alexa — expect voice-command gear, and more options to listen, to take center stage in 2018. There’s been a push by tech companies to move into audio, with Google buying the audio curation app 60dB, and Apple recently buying the audio search platform Audiosear.ch and the music recognition app Shazam. Audio publishers are bound to get a huge boost if Google surfaces playable audio clips in its news results, for example. And while some voice-command software may get a lot of flack for “eavesdropping,” the threat to user privacy is likely overblown. With all the new options to listen to voices and startups like Trint and Descript focused on automatic transcription of these voices (which can serve as huge tools for publishers), 2018 may just be the year of the voice. Brand safety was a huge watchword this year, from fake Russian accounts on Facebook to the discovery Google helped advertisers target people searching racist search terms, to the more recent revelations that YouTubers were reaping huge financial benefits from posting disturbing footage of children. You can expect Facebook, Google, and other platforms to be under the microscope even more in 2018. While many publishers can crow about creating safe curated spaces for advertisers, they too need to watch out for problematic issues when using programmatic ads. The battle against fake news and the filter bubble on platforms may have felt like it reached fever pitch in 2017, but as the weaponization of social media around the world shows, it’s a topic that’s here to stay, especially with the 2018 mid-term elections on the horizon. Google struggles to separate rumor from fact during breaking news, Facebook is at the center of a Rohingya massacre in Myanmar, and the Philippines’ right-wing president Rodrigo Duterte has also been using the platform to undermine opponents — including human rights activists and publishers who leverage Facebook as their main medium of distribution. Plus, Russia’s utilization of “social bots” to influence the outcome of the 2016 U.S. election is the precise reason Google, Facebook, and Twitter had to testify before Congress. With Donald Trump’s recent suggestion that the Access Hollywood audio in which he bragged about sexual assault was fake, expect more scrutiny on fake news in audio and video. The battle is only beginning. The recent attention on the skyrocketing valuation of Bitcoin may have raised people’s FOMO quotient, but the attention on the technology behind it — blockchain — could have a huge influence on publishers and advertisers. Not only can this cryptocurrency technology allow for efficient monetization of content, but as Daniel Newman writes in Forbes, it has the power to help curtail ongoing issues with ad targeting. “Because the chain is transparent and encrypted, companies can easily determine if the people viewing their ads are members of their targeted audience—or not—saving millions in ad spend each year,” Newman wrote. Indeed, there are a myriad of ways marketers can leverage blockchain. Publishers too can reap the benefits. A new startup called Civil, for example, looks to leverage blockchain to create a journalism platform free from fake news, advertising and outside influence. Blockchain also has journalists talking about its potential impact on news publishing. For all its potential, though, blockchain remains confusing to many people, so you can expect a lot of explainers in the new year as interest increases. It’s been a rough 2017 in many ways, and change is such a constant that it has become a way of life in digital publishing. But we can be sure that as digital advertising has surpassed TV ads for the first time that digital has stopped becoming the “other,” the “nerds in the corner” and has now become the center of publishing. So rather than pout and complain in 2018, it’s time to buckle up, sharpen our focus on new tech, new techniques, and new collaborations and partnerships, so we can make the most of this wild ride. 1. It’s not a mobile first-world, it’s mobile-only. In looking at platform-referred traffic by device type, we see that mobile has made stunning gains year-over-year. Last year, traffic from Google had just tipped over the 50% mark for mobile for the first time ever, showing a 51% mobile vs 42% desktop split. 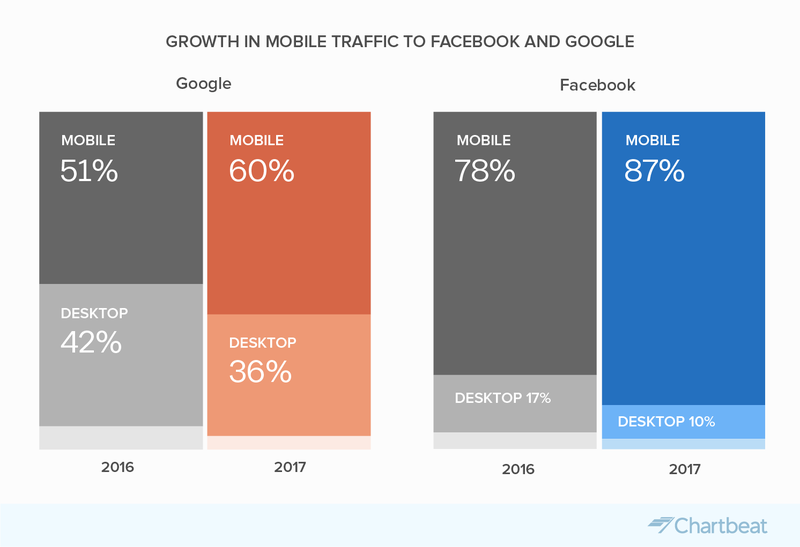 But from 2016 to 2017, Google mobile traffic grew from 51% to 60%, and Facebook’s grew from 78% to 87%. For publishers with high dependencies on platform-referred traffic, it is significant to note that most visitors are now coming via mobile. At least for platform-referred visitors, it is practically a mobile-only world. 2. It’s not that Facebook traffic is down, it’s that Google is up. Traffic that was referred from Facebook and Google to premium sites has been fairly steady over time, with Google driving roughly 1.25 billion visits per week and Facebook around 1 billion. The ebbs and flows in their traffic have stayed pretty consistent each month—until now. Due to recent major news events including the solar eclipse and hurricane Irma, we saw traffic coming from Google escalate in unprecedented ways in September. 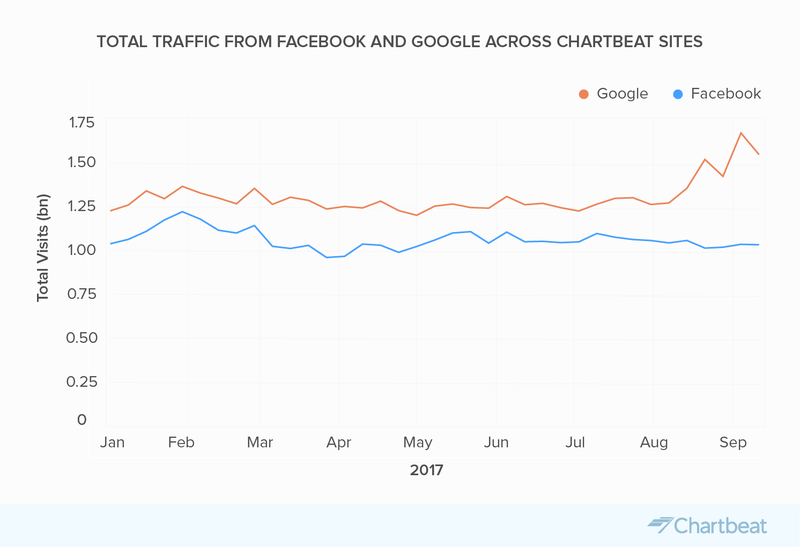 Recent reports have described a decline in Facebook traffic, but in looking very closely at multiple data sources, we see a different picture: While it is true that Facebook’s share of total traffic is down, the missing piece is that, in fact, the pie is much larger, and Google is up. So what does this mean for publishers? Newsworthy events, particularly those that are unfolding over time, are huge moments for search activity leading to direct traffic. Social traffic does not spike until afterwards, mainly around more emotional, reactionary content. 3. Demand for video is not constant; it spikes around breaking news. In looking at consumer engagement with video content, we see that it’s much more dependent on what’s in the news than text is. Below we’re looking at how much time visitors spend watching video, relative to the time they spend with text. The first notable thing is that this line isn’t at all constant — demand for video content really changes across the year. 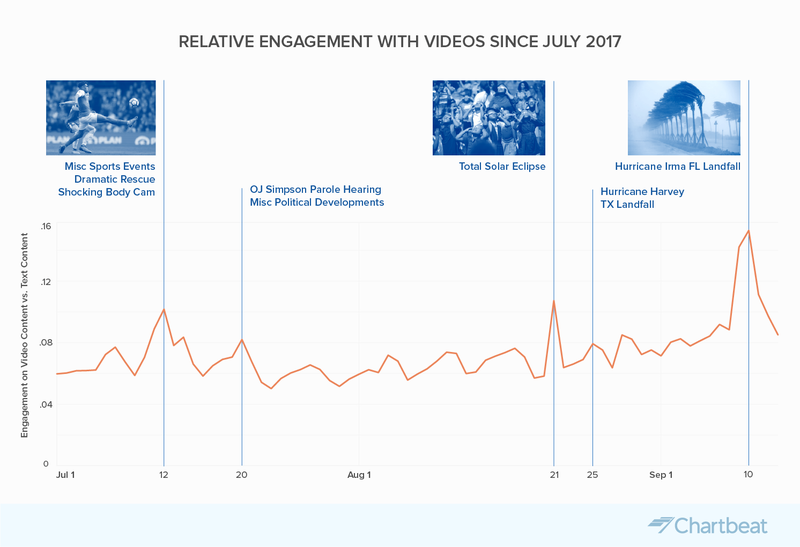 When we look closer, we see that spikes in video watching correlate with a few highly visual stories in the news (like hurricane Irma). And that makes sense: for highly visual news, readers look for a highly visual news medium. It is noteworthy for publishers that video demand is variable, and deeper insights here should lead to a better content strategy and smarter monetization. 4. Longer time reading content drives higher loyalty. How can media companies build and grow a loyal audience? Focus on engagement. Why is engagement as a metric so important? Chartbeat research shows that half of visitors who click through to an article hardly read what they land on: 45% spend less than 15 seconds on the page. 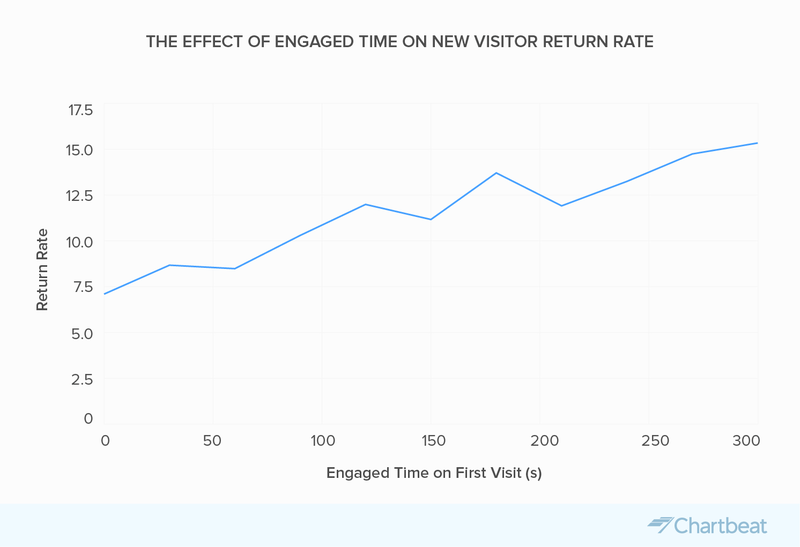 As you can see in the graph below, a new reader who engages for a longer amount of time during their visit is more likely to return. And the more they return, the more pages they consume and the longer they read on the page. This in turn, means they also view more ads on the page. Overall, optimizing for engagement can drive loyalty, and revenue. 5. The homepage is not dead– it’s the place for your most vital audience. Is the homepage really dead? Not at all. Yes, Facebook and Google are prime sources to target new readers, and those first time visitors are more likely to land on an article than a homepage. 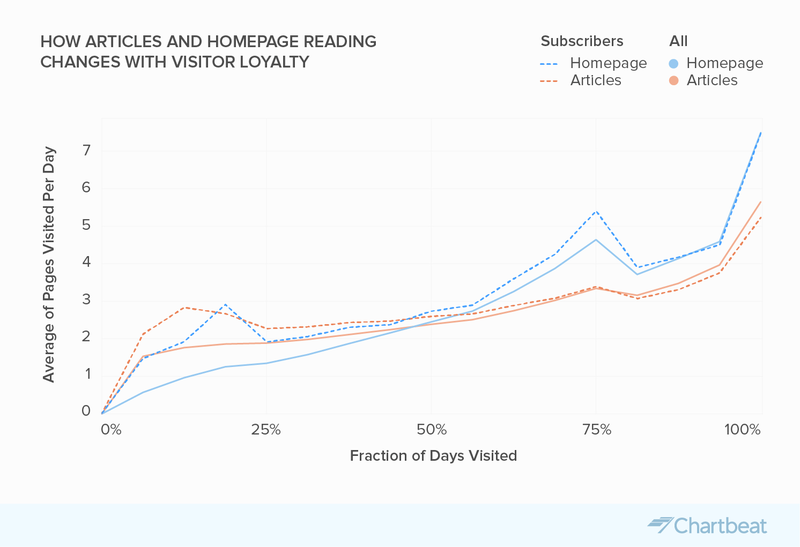 However, to our surprise, in looking at how article and homepage consumption changes by loyalty (based on the fraction of days a user visits in a two-week period), our data shows that frequently returning visitors build strong homepage habits. The lesson for publishers? It is becoming increasingly clear that there are different tools in the publisher toolbox as it relates to building and growing a loyal audience. While platforms are for acquisition of new visitors, driving direct traffic on your owned and operated properties is critical to retention. The homepage is more important than you might think–it’s where you’ll lose or retain your most loyal readers. The phrase “pivot to video” has become something of a cliché in the media industry. Lately, the mere mention of this phrase triggers a slew of mean-spirited tweets, resentment and existential mourning for the written word among those who wonder what publishers are thinking — and where their strategy lies. And that’s the rub when it comes to pivoting to video. Mashable, Vocativ, Mic, FoxSports, Vox, Vice Sports, and BuzzFeed, among others, have all jumped on the video bandwagon in the past couple of years. But just as they differ in how they restructured staff and resources, so too does the quality of video produced. It’s easy to feel the schadenfreude when hearing that web traffic dropped at a video-pivoter by 88%. Wow, how stupid was that move? But the reality is that pivots to video are not about pageviews at a website, but about serving up quality video that moves the needle on revenues, and engagement. They can be done right – or very, very wrong. With the Facebook-Google behemoth eating up nearly all of the growth in the U.S. digital ad industry, publishers are under pressure to somehow make money from ads — and banners and programmatic advertising aren’t doing it alone. In comes the promise of video advertising dollars, which are expected to generate more than $18 billion by 2020, according to eMarketer (nearly double the $10 billion in 2016). A survey by IAB of more than 350 advertisers found that advertisers would spend an average of more than half — 56%, to be precise — of their ad budget on video. Mashable was an early mover in the pivot to video last year when it laid off a slew of text reporters to double-down on video. More publishers followed this year. A major risk when pivoting is over-reliance on distribution platforms such as Facebook, YouTube, and Snapchat, which run these videos according to their enigmatic algorithms. Essentially, publishers relinquish control to third parties that have their own objectives and often provide poor and inconsistent metrics. Topping that off is data from Pew Research showing that millennials (often the target audience in these advertising goals) still prefer to read news in text. While she might be a little heavy on the hyperbole, she’s right when she says the main problem is that the video being produced by some publishers are all flash and no substance. Obviously, traffic isn’t the only measure for success for publishers, so traffic drops aren’t always a dire sign. Pioneer pivoter Mashable says it actually grew its revenue 36% in 2016 while increasing the traction of its videos on Facebook, YouTube, and other distribution platforms. It’s now facing a potential sale. And, while nothing has been confirmed, its valuation — likely at more than $300 million, based on trends — suggests there may be something to their pivot. Any smaller valuation would signal more skepticism. Meanwhile, BuzzFeed, which restructured last year in order to generate more video for its entertainment and news divisions, recently launched an original live-streaming program, “AM to DM,” on Twitter. In the same vein as Vox, BuzzFeed hasn’t shied away from admitting much of its strategy comes from trying and potentially failing. But unlike several other media outfits that have tried video, BuzzFeed has the resources to back up its editorial focus. “Video is an extension of what we do, not a liability or a threat to our journalism,” BuzzFeed head of U.S. news Shani O. Hilton wrote in a post. While much outcry has surrounded the traffic decline experienced by some of the publishers that have pivoted to video, it’s worth remembering that this is a correlation, not a causation of the pivot. It’s important to note that the publishers moving to video were looking for increased revenues and not pageviews. Among publishers, there’s a flight to subscriptions and paid content, as well as video – and they don’t have to be mutually exclusive. But for those going “all-in” on video, they better make sure the strategy pans out, attuned perfectly for social platforms, and for audience members. Not all video pivots will work, but not all video pivots will be flame-outs. With more than one media company laying off staff to “pivot to video,” the move bears some scrutiny. Understandably, those in the “text” camp emphasize the power and speed that written content brings, while the other side sees dollar signs behind video advertisers. But these opposing storylines hide nuances that need to be considered, if you’re considering video at all. First, the data. Yes, average time spent watching digital video is expected to keep growing and the prospect of television ad dollars ripe for the picking seems too good to not consider how digital sites can grab a piece of it. However, our research has also shown that video on media sites underperforms when it comes to content types: people spend, on average, 30% less with video posts than a non-video post. But all of that data ignores a crucial, but somewhat basic point: not all video is the same. Even for publishers that fit into one of those spaces, like the home decor and DIY site Domino, the number show that video does better when paired with text. “Our video needs to come in tandem with content. There needs to also be text with it,” Tracy Cho, Executive Director of Marketing, Growth and Analytics at Domino told the audience. The attendees agreed. We polled attendees and found 76% of them supported using a mix of content formats, while only 13% wanted to see a more sites pivot to video. Sachin Kamdar, CEO of Parse.ly, emphasized that any company making a pivot to video out of desperation would face challenges unrelated to the format itself, including poor internal communication and a culture unaccustomed to producing this type of content. However, he also noted that the opportunity that video presents needs to be taken seriously in an industry struggling for monetization options. The intersection of consumer intention, market dynamics, the added incentives of the tech platforms, and the ability to monetize means that any company not considering what video could mean for their business out of sentimental value to the written word could be missing out. With the advent of streaming video packages from Netflix, Hulu, and Amazon – and more stand-alone services from CBS, HBO, Showtime, and others – consumers finally started getting the “a la carte” option of unbundling. At least they could watch just what they wanted. At the same time, new providers like PlayStation Vue, Sling TV, and DirecTV Now began to offer up popular “skinny bundles,” smaller groups of premium channels at a lower price. As the choices proliferated for consumers, the question for content providers is how can they keep showing up on these ever-shrinking menus? They need to be everywhere, but that proves challenging for many players. Inevitably, some get left out of the musical chairs at this buffet. And lately, the channels that are suffering are those from middle-tier programming houses like Discovery and Scripps Networks Interactive, which focus on animals, food, and reality shows. So, it is not surprising that players like these would consider M&A options. Joining forces would allow them to create a new kind of “anorexic bundle” at as little as $3 or $4 a month. And that was likely a big driver in the recent sale of Scripps, which saw both Viacom and Discovery vying for a buyout. But in the end, Discovery won out, acquiring Scripps for $11.9 billion. It’s not just a purchase of additional content for Discovery — it’s a sizable step for both Scripps and Discovery in securing a place in media’s future. As cord-cutting continues to become more mainstream, mergers and consolidations are a viable strategy for media companies trying to stay afloat amidst lagging cable subscription revenues and increased streaming options. And mergers show potential for smaller media companies that might be cast aside as well as larger media companies that want to create a more appetizing menu for consumers. The aim, as Variety’s Brian Steinberg put it, is for these companies to have an upper hand in the ways that consumers connect to their favorite kinds of programming. Think about Comcast’s purchase of NBCUniversal back in 2009. Comcast has since become the powerful presence behind must-see properties like the Olympics, sports, and children’s’ programming. And that’s just one example. AT&T bought DirecTV in 2015 for approximately $48.5 billion and is about to close a $85.4 billion acquisition of Time Warner, owner of HBO and CNN. Lionsgate purchased Starz in a $4.4 billion deal. Charter Communications acquired Time Warner Cable last year for about $65 billion. The list goes on and consolidation seems inevitable in the chaos of changing viewing preferences. But will the Discovery Scripps combo be enough to get noticed by skinny bundles? Or can its own anorexic bundle attract enough attention to be viable on its own? Both Viacom and Discovery announced earlier this year plans to offer these newer, entertainment-only anorexic bundles to try to attract consumers. But at such low prices – $3 to $4 per month – will people really value them enough? That’s where Scripps comes along. The network has long attracted audiences — and subsequently, advertisers for those audiences — with popular lifestyle programming like HGTV and the Food Network. A Scripps acquisition, ideally, gives both companies a competitive edge when it comes to negotiating with traditional distributors like Comcast and Charter Communications. It also helps cut back-end costs. For Scripps, the acquisition also offers money to invest in better ad targeting. Ad buyers are also looking to media companies to help them better target younger audiences more prone to streaming rather than subscribing to cable. Still, a few analysts argue that a consolidation between Discovery and Scripps — and that mergers in general — may hurt chances of staying afloat. This is because they add even more programming when distributers are looking to cut content and offer more streamlined options. And neither Discovery nor Scripps air live sports in the U.S., which has long been considered one of the remaining driving forces behind television advertising. That really is the question. It also remains to be seen whether food and travel channels can succesfully make the leap to the many streaming services, or make a stand with their own service. Given that Nielsen is now adding Hulu Live TV and YouTube TV to its TV ratings, the shift to streaming — and ad spending on these digital TV platforms — seems destined to only accelerate. Now consumers will make the final decision on whether they want to fork over a few bucks for some morsels of content, or whether all these skinny bundles will add up to just another kind of bloated menu.